While you are inside wondering if winter will bring another chilling polar vortex, or six feet of snow, or 40 degrees Fahrenheit and rain, join me in contemplating the sweetness of plants. 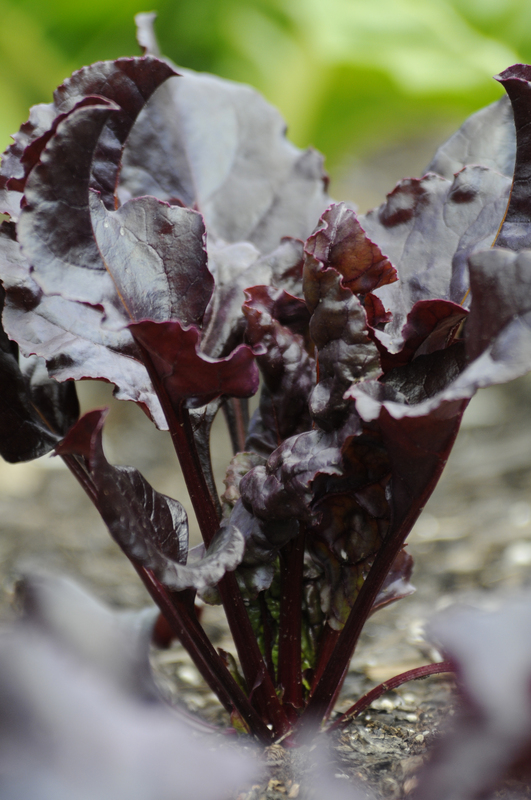 The common sugar beet, Beta vulgaris (this one is cultivar ‘Bull’s Blood’), is the source of our refined white sugar—not sugar cane! All sugar comes from plants. All of it. Plants are the only thing on earth that can make sugar, and plants are made of sugars. Even plant cell walls are composed of a substance called cellulose, which is a compound sugar. 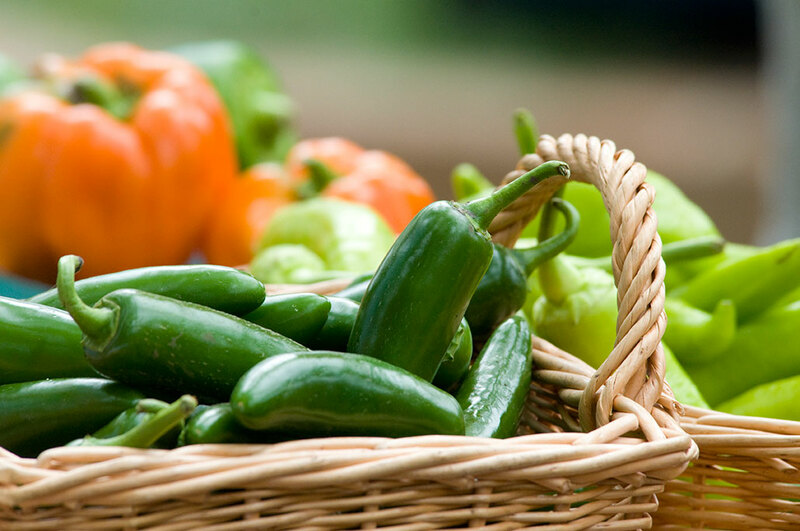 Sugars from plants are the basis of our food chain. Our favorite dietary sugar, sucrose, comes from the juices of sugar cane or sugar beets, which are boiled until the water evaporates, leaving the sugar crystals we all know and love as table sugar. Now that you know where your candy comes from, let’s use some sucrose to make a treat. 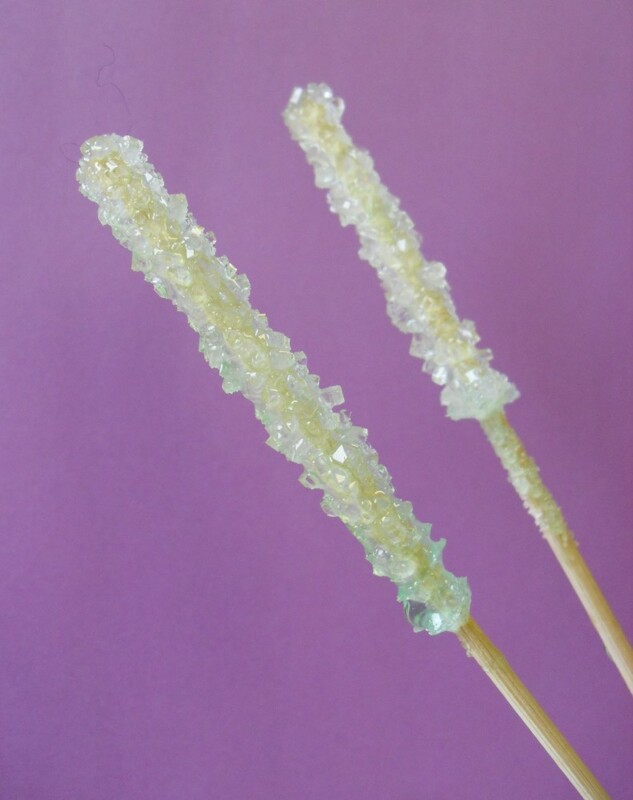 Rock candy is pure, crystallized sucrose, and you can make it at home. This will take one to two weeks, so get started now if you want to give it to someone special for Valentine’s Day. All the ingredients for the solution are assembled and ready to go. Note: the flavoring pictured here is not the best to use, because it contains alcohol. Use an essential oil for better results. First, assemble the hardware. Cut the bamboo skewer to 6–8 inches, depending how long you want it. Attach two clothespins to one end. They will rest on the edges of your glass, suspending the skewer straight down in the glass without allowing it to touch the sides. Cut a piece of paper towel with a hole in the center. This will go over the top of your glass to prevent dust from settling on the surface of the solution. Remove the paper towel and skewers; you’ll reassemble this after you’ve poured the solution in the glasses. 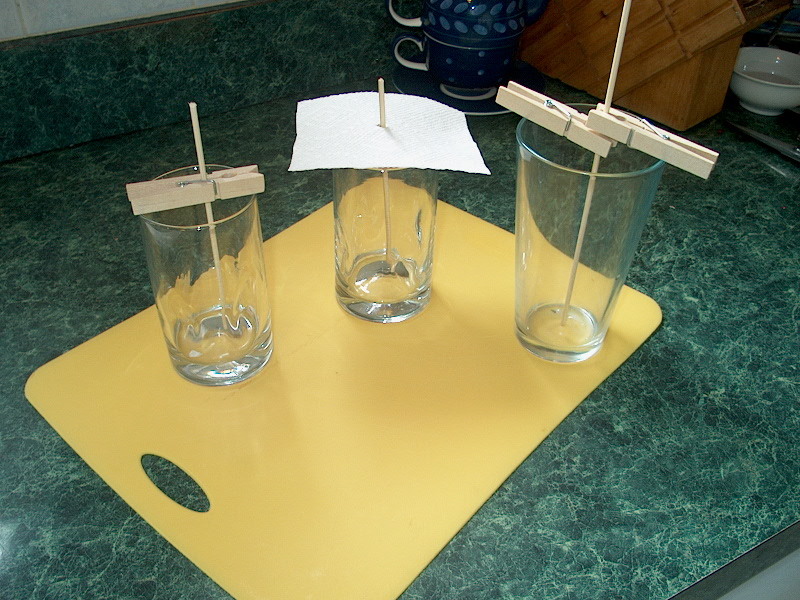 Suspend the skewers using one or two clothespins as pictured here, and be ready to cover loosely with a piece of paper towel like the glass shown in the middle. Important tip: The directions I followed (from a reputable source) instructed me to moisten the end of the skewer with water and roll it in some sugar to “seed” the formation of new crystals. When I tried this, the sugar crystals all fell off the skewer the minute I put them into the solution. Crystals will not grow on a bare skewer. What did work was dipping the skewer into the sugar solution (which you are about to make) and then rolling it in sugar. 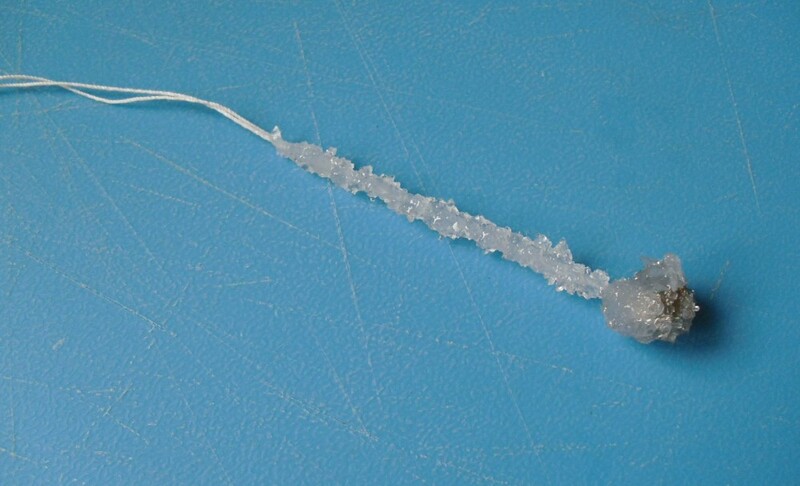 This kept the tiny sugar crystals stuck on the skewer and allowed larger crystals to grow. Making the sugar solution. Pour 1 cup of water in a saucepan and heat to boiling. Then turn the heat to low. You do not want to boil the water after you have added sugar, or you will make a syrup that is stable and will not yield crystals. Add the 3 cups of sugar gradually, and stir to dissolve. Push down any crystals that form on the sides of the saucepan during heating to dissolve in the water. This takes some time! Your final solution should be clear—not cloudy at all—and you should not see any crystals. You can choose to pour the liquid into two small glasses or one larger jar. If you want to color or flavor your candy, now is the time. 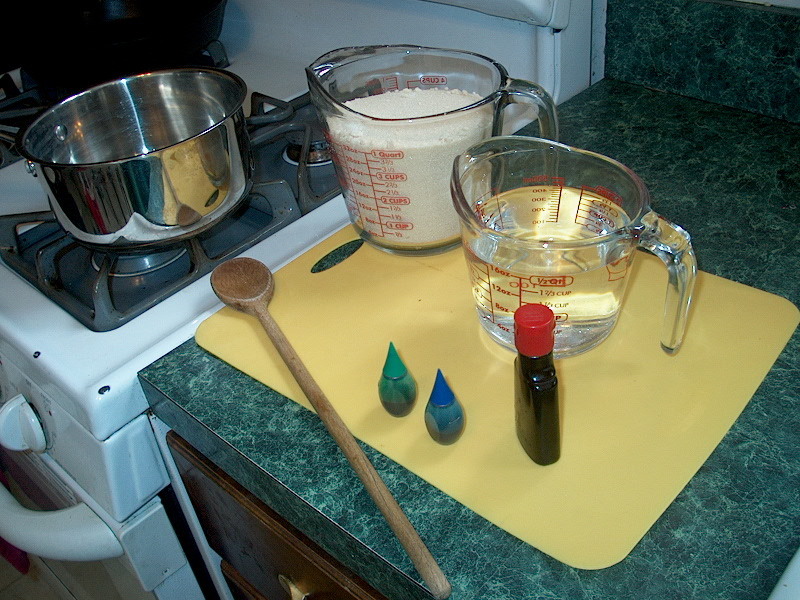 Add 2 to 3 drops of food color and/or 1/2 tsp of food-grade essential oils (like peppermint), and stir in thoroughly. Avoid using alcohol-based extracts like the bottle you see pictured in the blog. I’m not sure if this caused a failure during one of my trials, but I can say with certainty that I had better results when I used a flavoring oil. Dip the end of the skewer a few inches into the solution and remove. Let the excess sugar water drain into the pot, and then roll the sticky end in dry granulated sugar to coat evenly. Set aside. Pour the warm solution into the glass container(s), and fill to the top. With this recipe, you will get about 3 and 1/2 cups of solution, which will fill one jar or two glasses. You can scale the recipe up if you want more. After about eight days, you can see the cube-shaped sugar crystals on these skewers. The longer you leave them in the solution, the larger the crystals will grow. Carefully lower the sugar-coated skewer into the solution, holding it in place with the clothespins. Cover lightly with the paper towel and place it in a safe location where nothing will bump it or land in it for at least one week—two weeks if you want larger crystals. Do not totally seal your glass or jar. 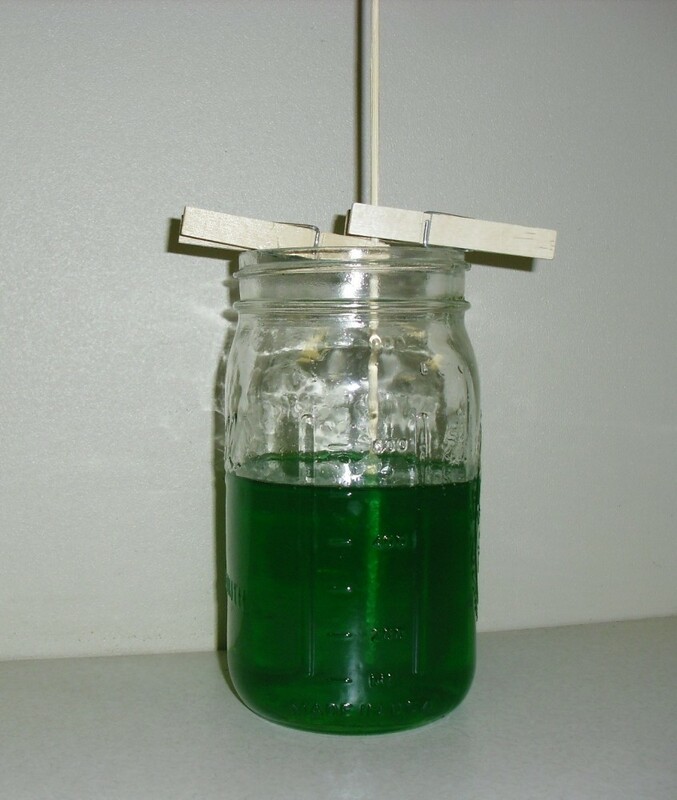 The water needs to evaporate for the sugar to come out of solution and crystalize on the skewer. If all goes well, then over the next week you will see large crystals forming only on the skewer. Got candy? Remove the skewer and drain the syrup. Eat immediately, or allow to dry, wrap in plastic, and save for later. Now that is what I call cultivating the power the plants! One more thing: You can use string instead of a stick. Tie a small weight on the bottom and tie the top to the a pencil balanced on top of the glass so that the string hangs in the liquid. The string was weighted with a metal nut so it would sink into the solution. While you are waiting for your sucrose to crystalize, let’s contemplate where it came from. You probably know that plants harness energy from the sun to convert water and carbon dioxide into sugar and oxygen in a process we call photosynthesis. This basic diagram shows photosynthesis in action. 6CO2 + 6H2O (+ light energy) C6H12O6 + 6O2. Translated, it means that inside plant cells, six carbon dioxide molecules and six water molecules combined with energy from the sun are converted into one sugar molecule and six oxygen molecules. 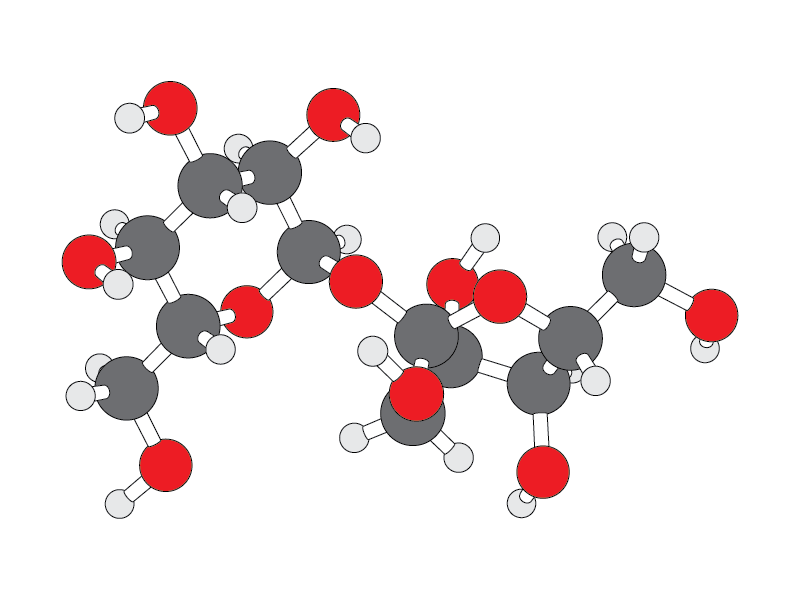 Glucose molecules are combined to form more complex sugars. Sucrose, or table sugar, has a molecular formula C12H22O11. It looks like two glucose molecules stuck together, but missing one oxygen and two hydrogen atoms (or one water molecule). This sucrose molecule looks good enough to eat! Just kidding. It looks better in normal scale. As I mentioned earlier in this post, plants are the only thing on earth that can make sugar. Through modern chemistry, food scientists have figured out how to extract and modify plant sugars more efficiently. They have also developed different kinds of sweeteners, because the food industry is always striving to develop less expensive ways to satisfy our craving for sweets, as well as supply alternative sweeteners for different dietary needs. 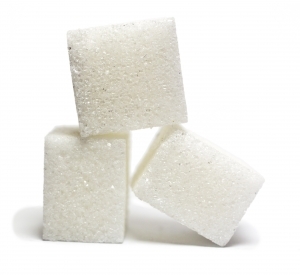 Some sugars you may see on food labels include dextrose (which is another name for glucose), sucrose, fructose, high fructose corn syrup, maltose, and sucralose. All of these “natural” sweeteners were processed from plants, even though they do not exist without help from a laboratory. Have you noticed that all of these sugars, including the sugars in plant cell wall structures, have names that end in “ose”? That is no accident. The suffix “ose” is the conventional way chemists identify a substance is a sugar. Go ahead, share that information at your next party as you consume goodies made from plant sugars. Having some chemistry facts at your sticky fingertips makes you sound smart while you’re nibbling on sweet treats. Please enjoy sucrose crystals responsibly, as part of a balanced diet that includes forms of sugars closer to their origins. (In other words, eat fruits and vegetables, too.) And remember to brush your teeth! Thanks, Ben. I hope your crystals grow spectacularly!